I sent for my first Quilts for Kids quilt kit and completed it within four weeks. Since all the fabric is cut for you, these are really fun and quick to put together. I’m working on one of my own to send back with it now. I’ll post the quilts that I complete for this organization here. 11/2009: The first one is Blue and Yellow Outer Space fabric. It measures 39″ x 44″. The backing is the same as the light blue inner border. 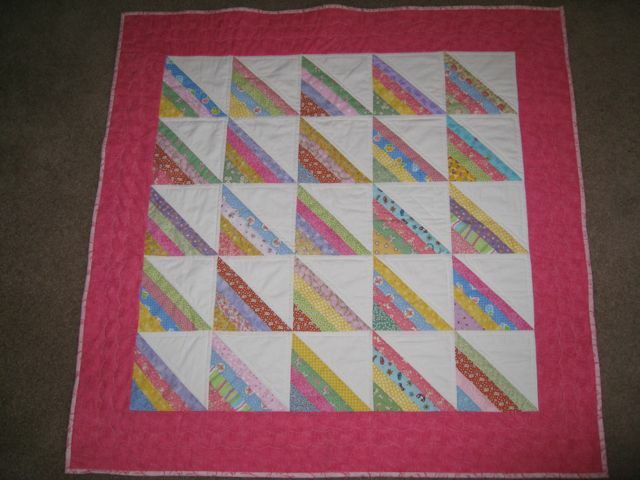 I used Warm and White cotton batting and quilted it with a simple diagonal grid about 4″ apart all over. The binding is some wild multicolor plaid fabric I bought to make a skirt for my niece for Halloween one year. Goes well with the colors in this quilt. 12/2009: This is a Roman Stripes quilt. Pattern from Mary’s web site. It is the quilt I sent back to Quilts for Kids with the one above. This was a fun block to make but not so fun to quilt. All that open white space. The backing is a Pink Ribbons for Life piece of yardage. 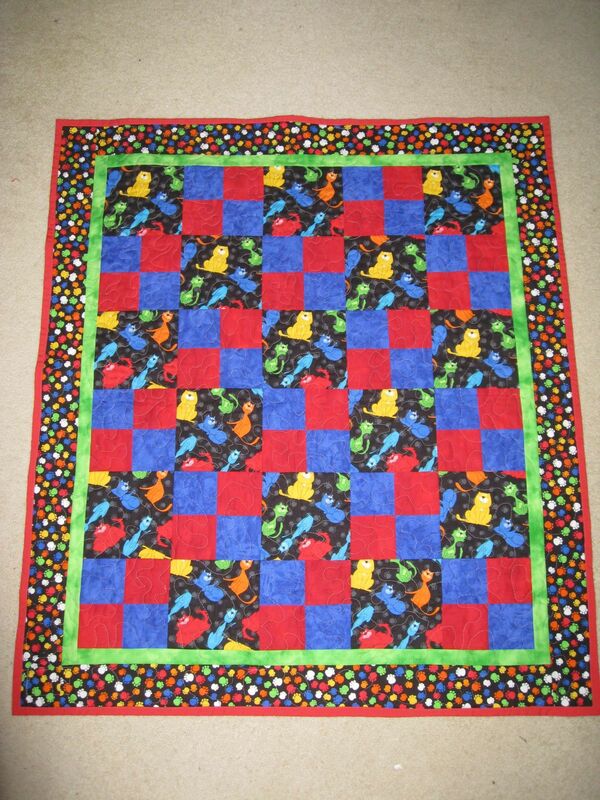 2/2010: The second Quilts for Kids kit I received in January. I bound it in some red fabric that was removed from the back of a blanket that was made for Darby when he was a baby. The front fabric was trucks and I used that in the companion quilt below. 2/2010: Same pattern as the kits that I’ve received so far. I cut up a blanket that was made of truck fabric and a backing of red cotton. 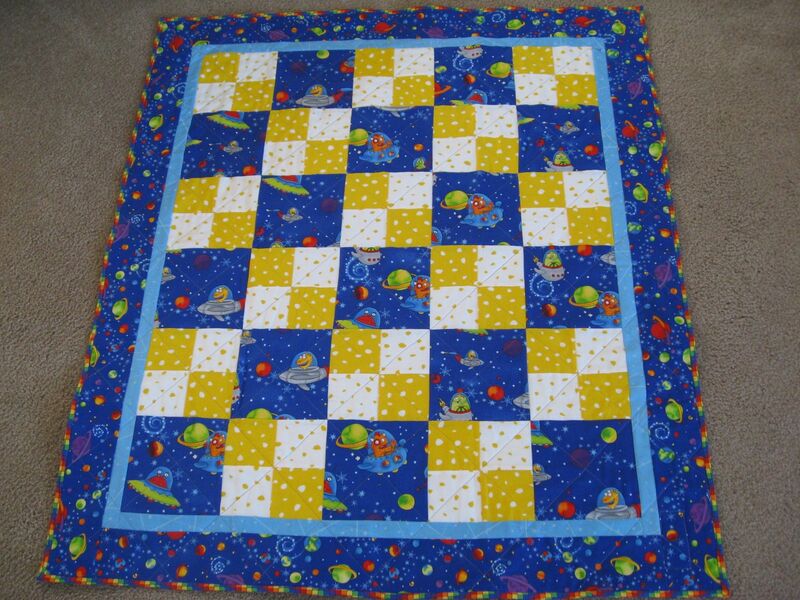 This was made for Darby when he was a baby and was in excellent condition. I thought this would be great use for this fabric. I cut enough squares to make 3 QFKs. 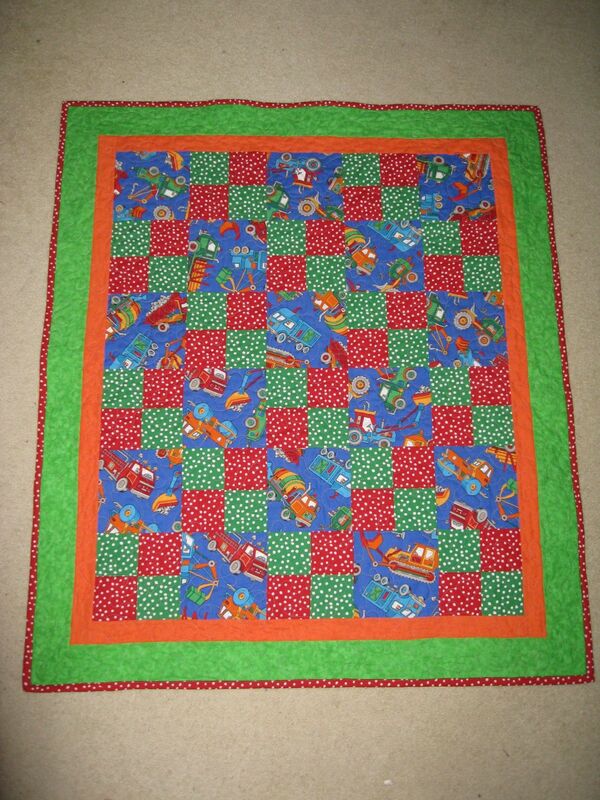 The four patches are made from dot fabric I got at JoAnn’s, the orange and green borders are also from JoAnn’s. The backing is some Bravest Dragon fabric from Avlyn Possibilites line that I bought last weekend for $1.00 a yard. The binding is the red dot fabric in the 4-patches.